Sunday 9th to Saturday 15th April saw the Tunisian capital city of Tunis play host to the 2017 ITTF African Junior and Cadet Championships as the continent's brightest young talent gathered at the Palais Des Sports d’El Menzah to fight it out on the table for the chance to claim silverware, pride and international recognition. The seven day event started off with team competition action as the opening three days of the 2017 ITTF African Junior and Cadet Championships saw countries from all over the continent compete for the six trophies on offer across the team categories. Egypt began the week in style with all of the titles available in the team events going to the country. Youssef Abdel-Aziz put in a standout performance in the Junior Boys’ Team final with his brace of victories helping Egypt over the line against Tunisia, while a similar result occurred in the Junior Girls’ Team final as Egypt and the host nation claimed the top two steps on the podium. However, one of the more thrilling tournament finals came in the Cadet Boys’ Team competition as Egypt was forced to recover from a trailing position to beat Congo Brazzaville 3-2 with Mohamed Azzam’s two wins proving valuable for the Egyptian squad. 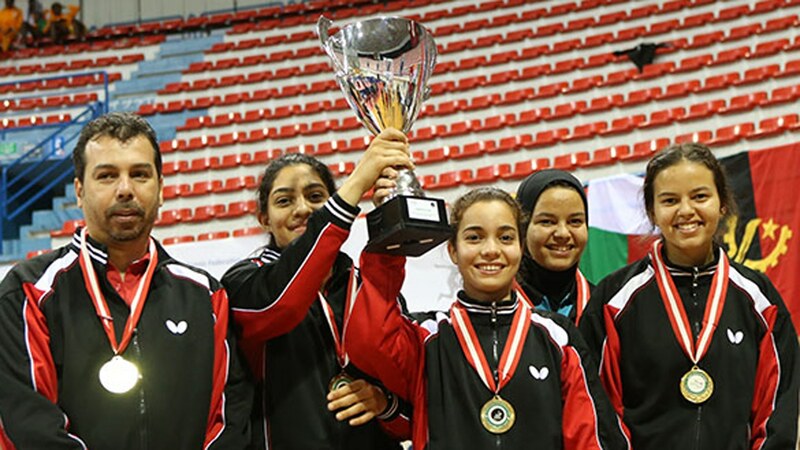 More success was yet to come for the Egyptians as the Cadet Girls’ Team, Under 21 Men’s Team and Under 21 Women’s Team trophies all ended up in the hands of competitors representing the country located in Northeast Africa. With the team competitions brought to a close, the focus turned towards the singles and doubles events. All three of the doubles titles went to Egypt, while a good number of the singles tournaments also produced positive outcomes for Egyptian contestants. Marwa Alhodaby edged out sister Mariam Alhodaby by a 4-3 scoreline in the Junior Girls’ Singles final (9-11, 8-11, 11-4, 11-5, 8-11, 11-4, 11-5), yet there was delight for Mariam Alhodaby in the Under 21 Women’s Singles draw as she saw off fellow compatriot Amira Yousry across five ends to seal the title (7-11, 11-8, 11-5, 11-3, 11-9). Two more categories were dominated by Egypt as Youssef Abdel-Aziz and Mohamed Azzam prevailed in the Junior Boys’ Singles and Cadet Boys’ Singles tournaments respectively, but despite a trophy clean sweep looking more and more likely to be achieved by Egypt it was not to be as the Tunisian spectators were treated to a couple of momentous occasions for the host country on the concluding day of the event in Tunis. With home advantage on their side Kerem Ben Yahia and Fadwa Garci picked up Tunisia’s sole pieces of silverware at the 2017 ITTF African Junior and Cadet Championships following victories against Algeria’s Naim Karali in the Under 21 Men’s Singles final (11-6, 7-11, 11-5, 11-7, 11-7) and the host nation’s Manel Baklouti in the Cadet Girls’ Singles title decider. Saturday 15th April was the seventh and final day of the 2017 ITTF African Junior and Cadet Championships, and while Tunis may have proved to be a happy hunting ground for Egypt’s youth players there were valiant efforts produced by several competitors from other nations including the hosts Tunisia. Upon reflection of the week’s action at the Palais Des Sports d’El Menzah I believe it’s safe to say that African table tennis has great potential for a bright future in the sport.